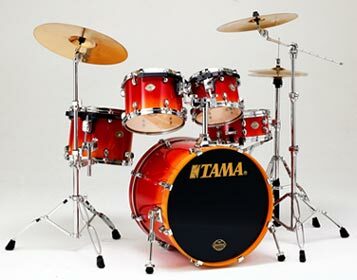 After the huge success of Tama's Dark Cherry Fade finish which debuted at the Summer 2001 Nashville NAMM show, Tama will add another fade finish, Aztec Red Fade, at the 2002 Nashville show. "We expected good things from our first fade finish," said Koji Kamada of Tama, "we just didn't expect how good. Even if the new Aztec Red Fade does only half as well, it will still be hugely successful. However, from early reactions I think Aztec Red Fade fare as well if not even better." Tama Starclassic Performer drums feature shells of 100% birch. Starclassic Performer also sets include the Star-Cast mounting system, die-cast hoops on all toms, and the new Tama Roadpro stands. Ten different painted finishes are available including the new Aztec Red Fade finish. Starclassic Performer drums feature 100% birch shells (6mm 6 ply toms and floor toms/7mm 7-ply bass drums). Ten painted finishes are available: DCF Dark Cherry Fade, NTB (Natural Birch, AMG Amber Gold, IDB Indigo Blue, TBK Transparent Black, TRG Transparent Green, VLT Violet, WN Walnut, GBK Gloss Black, and the new ARF Aztec Red Fade.